There have been new hilarious revelations about that BBC interview, making the whole thing even funnier. 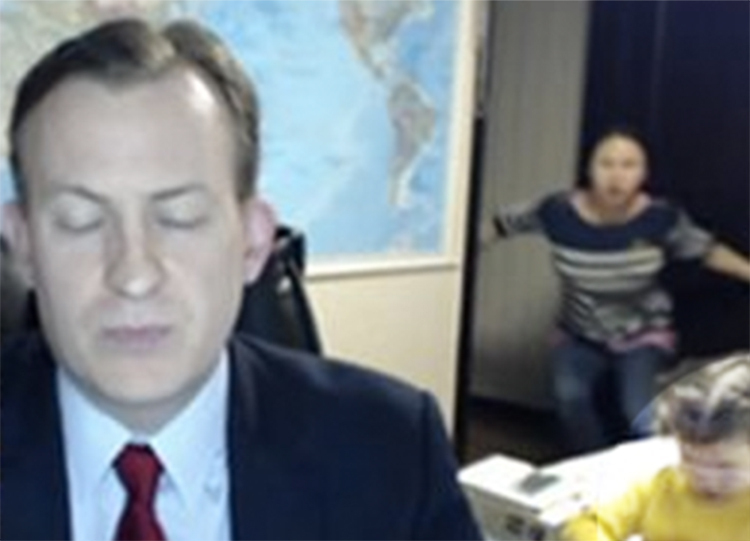 If you haven't seen the interview yet, it shows BBC correspondent Robert E Kelly taking part in an interview from his home, conducted via his laptop. Unfortunately, one of his kids burst into his room when he was answering a question about the impeachment of the South Korean president, disrupting the interview somewhat. After a few moments, his second child bursts in on their little walker device. Shortly followed by their mum. Watch the full video below from BBC Newsbeat. You won't regret it. The video went viral around the world. The BBC invited them in for a follow-up interview with the whole family, and they've had several amusing press conferences since. Well now further details of the incident have come out, outlining what was going on backstage, and it makes the whole situation even funnier. It turns out that their daughter wasn't unaware that her dad was on TV. In fact, she was watching her dad on TV from the other room, and had been told not to go in there. Just before the little girl strutted into the room like she's headed to the dance floor, she saw her dad on screen and thought "that dude needs my help" and waltzed right on in there to liven things up a bit. Meanwhile it turns out her mum watched in yet another room. And since the feed wasn't quite live, she didn't realise her kids had crashed the in room for a good ten seconds. Which explains why she looked so shocked when she first burst into the room and looked around in panic. She wasn't expecting both kids to be in there, just her older daughter. But so far there is no explanation for why she chose to jump to the floor when outside and sneakily close the door like this.